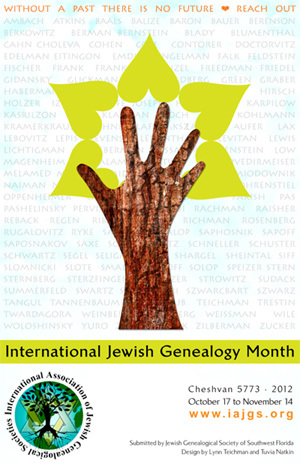 Cheshvan is approaching, and that means International Jewish Genealogy Month (IJGM) will soon be here. This year, IJGM is from October 17th to November 14th. UJGS will be kicking off the month with a Library Research Night on October 16th and ending with a meeting on November 13th. Both events are at the Family History Library in downtown Salt Lake City. This Library Research Night (LRN) will be open to anyone, members and non-members. From 5-9pm, we will find a place at the FHL to do our research together. Our more advanced members have volunteered to help the others to do their research. Have a brick wall you need help busting down? Need to move into new research territory — a new country, a new language? Are you a beginner and need to know where to start your family history? We want to help. If you plan to be there for LRN, we’d prefer to hear from you in advance. Let us know what you want help with so we have a chance to prepare, and so we know how many people to expect. The next meeting of UJGS will be Tuesday, September 11th, from 7-9pm MDT, at the Family History Library. We will meet in the main floor classroom. We’ve got a few topics on the agenda for this meeting. The first international IAJGS conference since 2004 was this summer in Paris and we had several members in attendance. In two years, the conference will be coming to Salt Lake City and we are co-hosting; it’s just about time to start some of the planning. We’ve got a society project in the making and we hope some of you will be excited to participate. And our own president spent three weeks in Europe visiting ancestral towns and doing research, so you’re sure to hear about that. We will be broadcasting via webinar again for anyone who can’t be there in person. You may register at this link. Watch this video if you’re unfamiliar with the GoToWebinar software so you can understand more about how a webinar works. Of course, you are free to arrive early to do some research at the library or get some done afterwards. Some of us will be happy to help our members with their research after the meeting. Details and maps about parking are on our web site. After last year’s success at Library Research Night (LRN), we will probably have two or three this year. Our first one is scheduled for June 19th, next Tuesday, from 5-9pm. We’ll have some signs up for you to find us. LRN is a chance for our members to visit the Family History Library (FHL) together to do some research. The beginner level genealogists can ask for help from those with more experience and we can all share our queries and successes. For our test run last year, we had one member who had never been to the FHL before and others who hadn’t been back in years. People come from all over the world to research at the FHL. As locals, we should be using it more — genealogists everywhere wish they could be here more often. LRN is for UJGS members only, but anyone is welcome to join us in order to attend. Our dues is still just $10. The next meeting of UJGS will be Tuesday, May 8th, from 7-9pm MDT, at the Family History Library. We will meet in the main floor classroom. Our speaker will be our very own Todd Knowles, presenting The Hidden Treasures of FamilySearch. Many times, the search for our ancestors leads us to records we either can’t access or are unavailable. This presentation will help open up the hidden treasures of FamilySearch.org and hopefully bring to light collections where the records of our ancestors can be found. After a successful test run at our last meeting, this one will be our first live broadcast webinar. Anyone may attend. Register at this link. The session will be recorded and made available to members at a later date. If you have never attended a webinar, or specifically a gotowebinar session, you may view an introductory video online. UJGS is having its first meeting of 2012 on Tuesday, March 13 20th, from 7-9:00pm at the Family History Library. More location details, including the address and where to park (the museum lot is free in the evenings), are available on our Meetings page. We’ve been trying to make some changes to the society, so things are still in flux for this meeting. We should get it all figured out in the next week. Edit: It has been brought to our attention that the Utah Democratic Caucuses are on March 13th, so we have moved the meeting date to one week later.